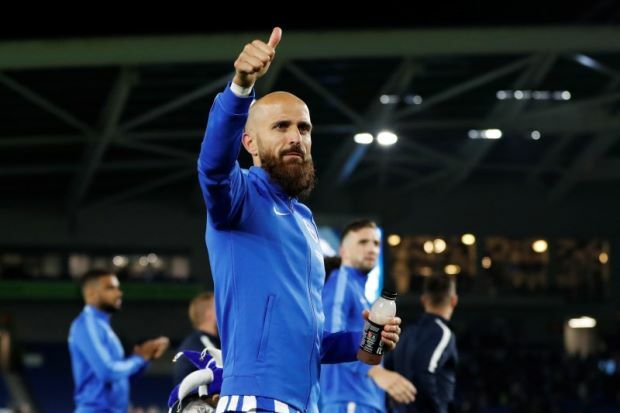 Brighton and Hove Albion skipper Bruno will miss Sunday’s Premier League match against Manchester United with a hamstring issue, manager Chris Hughton said on Friday. Bruno came off injured in Brighton’s 2-0 defeat by Watford last weekend and the Spanish defender will resume training only at the end of the week. “Bruno will miss out. He felt his hamstring. The good news is that it’s nowhere near as bad as we probably thought,” Hughton told a news conference. New signing Florin Andone (groin) and winger Jose Izquierdo (knee) will also be out due to ongoing injury problems. Former Valencia right back Martin Montoya could make his debut as the close-season signing fills in for Bruno. “He is at a good level and is available to play as it stands and he’s arrived at a good level,” Hughton added. Brighton beat United 1-0 at the Amex Stadium last season to secure their top-flight status. “We have to make sure that we use our experiences of last season and the good moments we had. “I’d like to think with our additions that we’ll improve this year,” Hughton said.